Some information on Ultraviolet water disinfection. Leading companies around the world that manufacture water treatment use new generation ultraviolet radiation systems for water disinfection. The main difference between new generation Ultraviolet lamps and those used in the past (such as the Philips “TUV type”) is the higher Ultraviolet radiation intensity produced by these lamps. In the USA, Canada and European countries normal Ultraviolet intensity at the end of Ultraviolet lamps should be no less than 40 mJ/cm2 to ensure effective disinfection. New systems being built and designed in the USA have Ultraviolet intensities from 50 mJ//cm2 to 100mJ//cm2. Only under such Ultraviolet intensities can the effective inactivation of pathogens in water be assured. These systems also require water with low turbidity for effective performance. 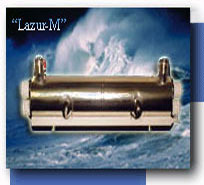 The Omni Environment Group has access to new disinfection technology (Lazur system) developed by Russian scientists. This technical breakthrough uses the simultaneous application of new generation Ultraviolet amalgam lamps and ultrasonics for disinfection of water. This produces a highly effective disinfection system that has very low power requirements (less than 5-8 W/m3). Ultrasound prevents overgrowing of Ultraviolet lamps surfaces and disinfects water itself. The disinfection costs are less than 0.004 USD/m3 compared to 0.07 USD/m3 for conventional systems. These figures were presented in almost all reports at the 2-nd International Congress on Ultraviolet technologies in Vienna in July 2003. The water transparency should be no less than 85% and the number of suspended particles no more than 1 mg/l. The water quality in all Russian regions (cities) much worse than the above-named parameters and Ultraviolet equipment used is not able to provide the necessary for inactivation Ultraviolet radiation doses. The Russian norms – 16-20 mJ/cm2 are beneath all criticism. That's why the reports of Russian scientists on new disinfection technology – simultaneous influence of ultraviolet and ultrasound on water – attracted the great attention of all leading world companies. It is a breakthrough in the area of iron removal disinfection technology because during the simultaneous Ultraviolet and US influence on water power imputs do not exceed 5-8 W/m3. The disinfection costs of 1 m3 water do not exceed 0,004 USD/m3 (in the USA – 0,07 USD/m3). Ultrasound prevents overgrowing of Ultraviolet lamps surfaces and disinfects water itself. The effectiveness of this method has been proved (4 year's cooperation with the Republic of South Africa's scientists) and it exceeds the usual Ultraviolet in hundreds times. If we consider pathogenic microflora strengthening (we see this process in the last decades) to Ultraviolet influence it will be clear that the most reasonable and economic disinfection method (especially in houses) is ultrasound + ultraviolet. At the same time “Lazur” equipment prices are lower in comparison with other Russian companies (NVR, LIT, etc). In some Moscow houses, offices, banks, hotels, swimming-pools “Lazur” equipment work successfully. “Lazur” units are used by Russian Government and Moscow Patriarchy.